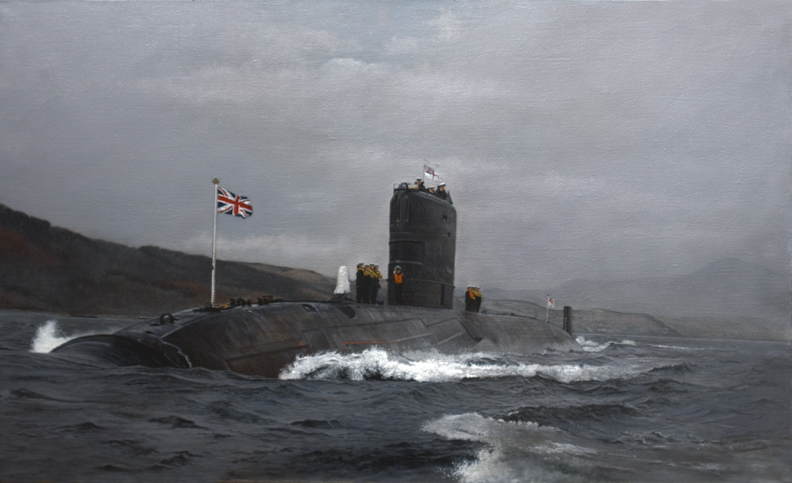 This painting of HMS Trenchant is of a Trafalgar-class nuclear powered submarine. Sometime ago, I painted the flagship to this submarine (HMS Trafalgar) which was entered into a Navy Days exhibition in Plymouth, the exhibition was given over entirely to submarine pictures and the painting was sold at the exhibition. The painting of HMS Trenchant is seen here on trials, coming into Faslane, Scotland and was selected for exhibition at the Royal Society of Marine Artist at the Mall Galleries. I have the painting in my collection (although I would consider selling).